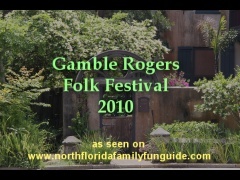 The Gamble Rogers Folk Festival is an Annual Event the first weekend of May, drawing thousands of music lovers to downtown St. Augustine, Florida, to celebrate the life and legacy of Folk Legend Gamble Rogers. Gamble Rogers, a troubadour, a story teller, a weaver of words and melodies, deeply delighted generations of loyal listeners, with his tales of wisdom, life, and philosophy. Tragically, Gamble Rogers died in 1991, as he was trying to save a drowning swimmer in Flagler County, Florida. He gave his life trying to help others, which was the hallmark of his life here on Earth. His memory lives on in his words and in his music, and this festival brings together his friends, fans, and now a whole new generation to come and celebrate his life and legacy, through the love of music. This festival draws thousands of people over a 3 day weekend, with 12 stages strategically placed throughout the downtown St. Augustine area. This wonderful family-friendly event is perfect for a warm spring afternoon, strolling from stage to stage, throughout the downtown area, checking out all the sites, listening to some fantastic local and national folk music greats. I enjoyed my time at the festival, and I hope you will come see it next year! Thank you for your wonderful musical contributions!